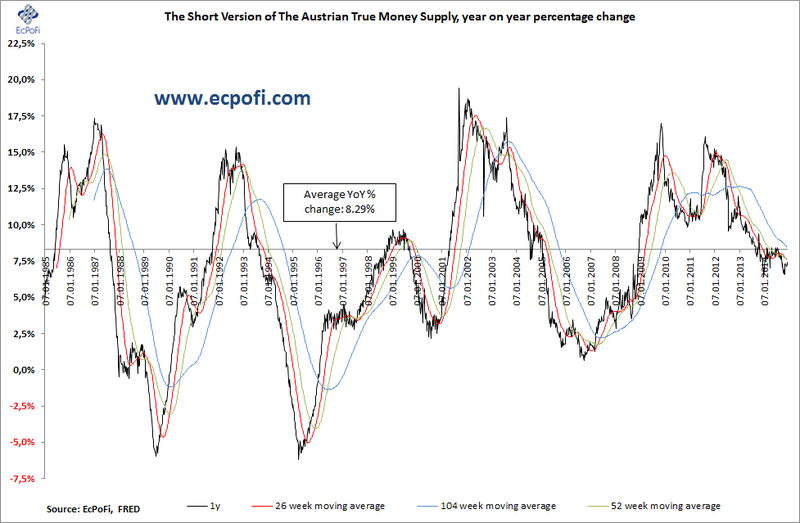 The short version of the Austrian True Money Supply for the U.S. increased 0.42% on last week for the week ending 15 December 2014. 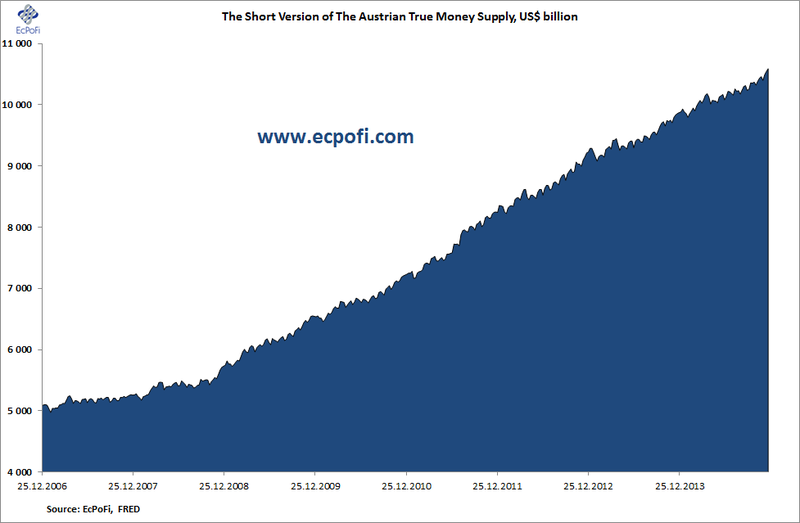 At $10.5883 trillion, a new high, the money supply is now up $705.0 billion, or 7.13%, year to date. Since 15 September 2008, the week of the Lehman collapse, the money supply has by now increased $5.1660 trillion, or 95.27%. The 1-year money supply growth rate increased to 7.43% for the week, the highest recorded for 12 weeks. A rare occurrence during the last 2.5 years or so, the 1-year growth rate for the week edged higher than reported one year ago. With the Fed having ended QE3 in October, there is now tremendous pressure on U.S. banks to create the necessary amount of bank credit to support the money supply growth rate. This could prove a tall order in 2015 and will be key to how the artificial economic growth in the U.S. fares in the new year. 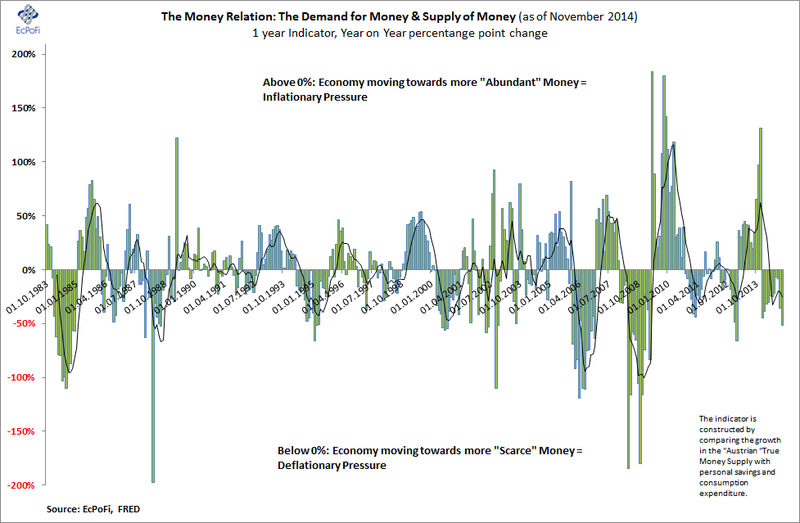 The money relation shows the relationship between the supply and the demand for money. 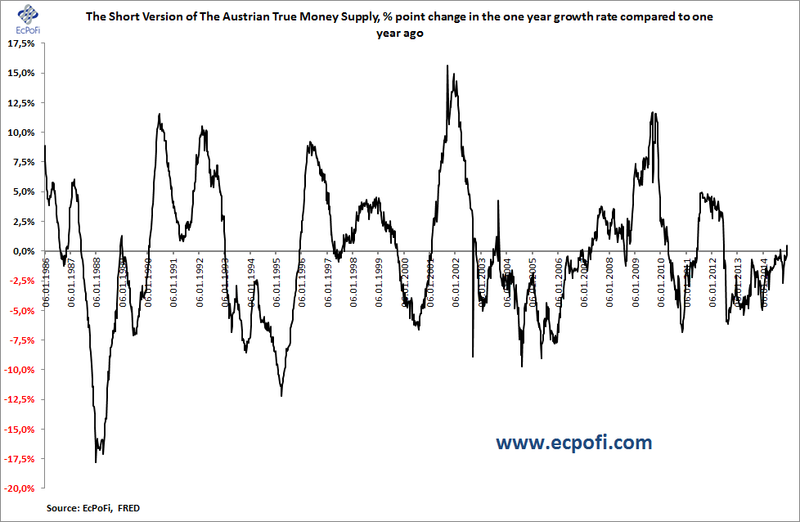 As money supply growth has slowed this year and the personal saving rate has remained largely unchanged, money has become less "abundant" in recent months than has been the case during the last two years or so. This indicates the U.S. economy is currently moving towards a less inflationary environment which could be a negative for U.S. stocks and a positive for U.S. bonds and the U.S. dollar (arguably already priced in for bonds and the dollar). 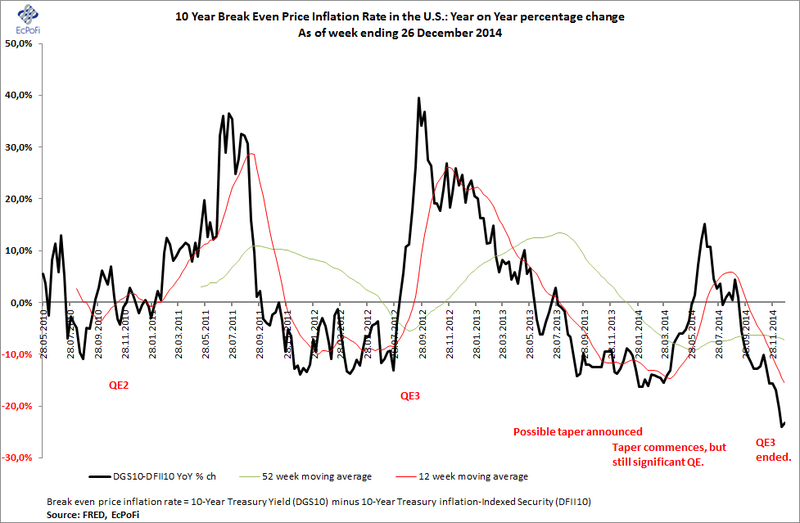 The break-even price inflation rate is also signaling that expected price inflation has dropped significantly during the last couple of months. 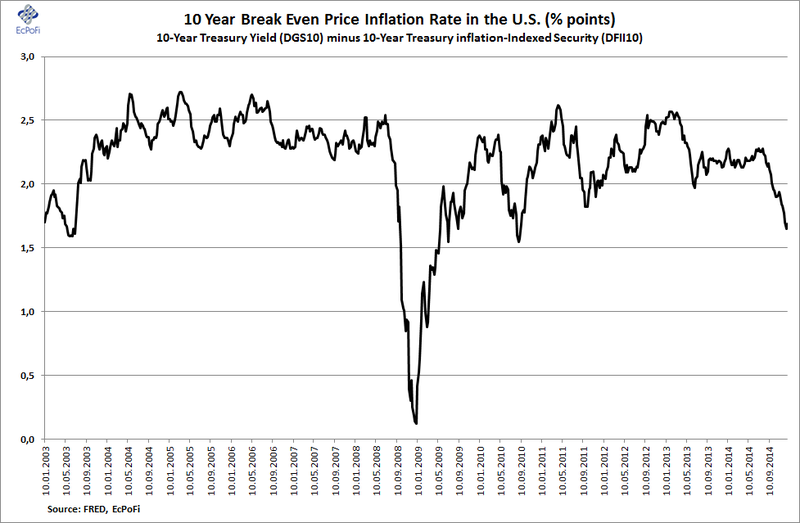 The current expected price inflation of 1.69%, calculated as the difference between the treasury yield and the yield on the treasury inflation-indexed security (both 10-year securities), is the second lowest reported for more than four years (beaten only by last week's 1.65% reading). This sharp drop in price inflation expectations becomes perhaps even more obvious if one looks at the year on year percentage change in the break-even rate. As I mentioned above and have been pointing out regularly throughout 2014, with the Fed tapering and ultimately ending QE3, banks are yet again the primary drivers of the money supply growth rate. Assuming QE4 is not implemented in 2015 (I would not bet on it! ), U.S. banks will be required to create out of thin air $813 billion in new money in 2015 just to maintain the 7.7% average growth rate in the money supply recorded this year. This is no doubt achievable for the banks as it represents only a 6.7% increase from what they managed to create in the previous record year for bank credit growth back in 2007. 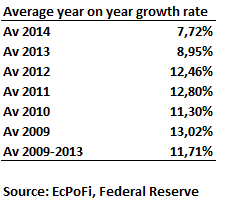 Also, this time around banks have tremendous amounts of fire power thanks to record levels of excess reserves. If banks don't issue enough new credit (and hence money), the U.S. money supply driven "economic growth" will end with a bang. If banks generate enough credit to maintain and increase the money supply growth rate, this can only result in postponing an inevitable correction and lead to yet further distortions. A third option is that banks really step on the credit pedal as they compete for money hungry borrowers with grand plans (including government spending). If that ever was to happen, nominal growth and price inflation could surge in 2015 if the Fed doesn't increase reserve requirements, only to be followed by an ever bigger bust. Whatever happens, 2015 will be an extraordinary interesting and dangerous year for investors and economies around the world. And do keep in mind: danger lurks whenever new money is created and the more it exceeds whatever is saved in an economy (one indicator of the size of the inflationary distortion), the worse the inevitable correction.